Use of viral promoters in mammalian cell-based bioassays: How reliable? Cell-based bioassays have been suggested for screening of hormones and drug bioactivities. They are a plausible alternative to animal based methods. The technique used is called receptor/reporter system. Receptor/reporter system was initially developed as a research technique to understand gene function. Often reporter constructs containing viral promoters were used because they could be expressed with very 'high' magnitude in a variety of cell types in the laboratory. On the other hand mammalian genes are expressed in a cell/tissue specific manner, which makes them (i.e. cells/tissues) specialized for specific function in vivo. Therefore, if the receptor/reporter system is to be used as a cell-based screen for testing of hormones and drugs for human therapy then the choice of cell line as well as the promoter in the reporter module is of prime importance so as to get a realistic measure of the bioactivities of 'test' compounds. We evaluated two conventionally used viral promoters and a natural mammalian promoter, regulated by steroid hormone progesterone, in a cell-based receptor/reporter system. The promoters were spliced into vectors expressing enzyme CAT (chloramphenicol acetyl transferase), which served as a reporter of their magnitudes and consistencies in controlling gene expressions. They were introduced into breast cell lines T47D and MCF-7, which served as a cell-based source of progesterone receptors. The yardstick of their reliability was highest magnitude as well as consistency in CAT expression on induction by sequential doses of progesterone. All the promoters responded to induction by progesterone doses ranging from 10-12 to 10-6 molar by expressing CAT enzyme, albeit with varying magnitudes and consistencies. The natural mammalian promoter showed the most coherence in magnitude as well as dose dependent expression profile in both the cell lines. Our study casts doubts on use of viral promoters in a cell-based bioassay for measuring bioactivities of drugs and hormones for human therapy and suggests caution regardingtranslation in toto, of a research technique as a cell-based bioassay for drug screening. One of the principal focus in drug development for human therapy is synthesis of its potent analogs with enhanced clinical efficacy at a reduced dose. An important facet of this endeavor is improving the method used for their testing. Cell-based bioassays using a receptor/reporter system have been proposed as an alternative to animal based methods for screening of steroid analogs. The cell-based receptor/reporter system involves introduction (transfection) of mammalian cells with DNA elements, such as 'promoters', 'hormone response elements' (HREs), 'enhancers 'etc. which, control expression of genes in mammalian cells. Before transfection, these elements are spliced into a vector, usually a plasmid (the extra chromosomal self replicating circular DNA found in bacteria) into which DNA sequences that code for an easily measurable enzyme are inserted. The enzyme serves as the reporter of function of DNA elements controlling gene expression. On transfection into mammalian cells and induction by hormone, promoter and other gene controlling DNA elements in the reporter gene construct mediate expression of reporter enzyme. Estimation of reporter enzyme gives their magnitude of functional efficiency in controlling gene expression. The whole construct termed as reporter gene construct was initially used as a research tool. Reporter gene constructs containing viral promoters were transfected into cell lines for elucidating the expression of genes regulated by steroid hormones. This led to our understanding that on entering a cell the steroid hormone binds to its receptor to form 'steroid-receptor complex' (SR complex). The SR complex then interacts with the steroid specific HREs and promoter on its cognate gene to initiate the gene expression. Gene constructs with viral promoters were used because they could be expressed with high magnitude in a variety of cell lines, including cell lines that do not express steroid receptors by cotransfecting with vector constructs expressing steroid receptors. This suggests that steroid hormone regulated genes require only steroid receptor for their expression. However, it is not the case with mammalian gene expression in vivo. Mammalian genes are expressed in cells/tissues, which pre-express specific/homologous transcription factors, besides steroid receptors, thereby making them (i.e. cells/tissues) specialized for specific function. Putative co-activators and auxiliary specific transcription factors [1, 2] efficiently and accurately synchronize mammalian gene expression in target cells. Therefore target cells as cell-base and reporter gene constructs containing mammalian promoters, instead of viral promoters as a reporter module, may be more reliable elements in a mammalian cell based-receptor/reporter system. However, reporter gene constructs with viral promoter are being expressed in a variety of cell lines in laboratories with different objectives. This includes expression of gene constructs with viral promoter in mammalian cells for measuring /screening of steroid hormones. Cotransfection of reporter gene constructs containing promoter elements of viral origin and vector constructs expressing steroid receptors into cells that do not express steroid receptors have been suggested for screening of estrogen and progestins [3–5]. However, in case of hormones like progesterone, two isoforms of PR termed as PR-A and PR-B, coexist in human breast [6–8] and endometrium [9–11] and both isoforms have a role in regulating progesterone induced gene expression. Therefore the type and amount of receptor expression vector used for cotransfection along with reporter gene construct in non-target cells may add to complexity in interpretation of the outcome. Further keeping in mind the principal focus of drug development to have more potent analogs of drugs, it is essential to relate the bioactivity of 'test' compound to a 'Standard' compound. Therefore to relate the potency of 'test' compound, it is essential to evaluate the response of a reporter gene construct to sequential dose of a 'Standard' compound to get a dose-response expression profile. To get a realistic measure of the bioactivities of 'test' compounds, choice of cell types as well as the promoter in the reporter gene construct is of prime importance in a mammalian cell-based receptor/reporter system. Our objective was to select the reporter construct with most reliable promoter to relate the bioactivities of progestins or compounds with progesterone like activities to progesterone as a 'Standard'. The criteria for reliable expression of reporter vector were highest magnitude as well as consistency in dose-response expression profile, on induction by sequential doses of progesterone in an identical target cell environment. We examined three reporter gene constructs, designated as reporter vector' containing PRE (progesterone response element) and promoter of viral or mammalian origin inducible by steroid hormone progesterone. The reporter vectors were plasmids pPRE-tK-CAT and pMMTV-CAT containing viral gene promoter sequences and a reporter vector plasmid pUG-CAT, containing natural mammalian promoter sequences from uteroglobin gene (UG), which responds to progesterone in rabbit  and human  endometrium. CAT (chloramphenicol acetyl transferase) enzyme in the reporter vectors served as a reporter of magnitude and consistency in their function. All the three reporter vectors were transfected into human breast cell lines T47D and MCF-7 in parallel experiments and induced by sequential doses of progesterone, ranging from 10-12 to 10-6 molar. Both these cell lines expressed the two isoforms PR-A and PR-B, in culture, thereby eliminating cotransfection of vector constructs of PR isoforms, which stabilized at least one variable that otherwise may have affected the outcome. 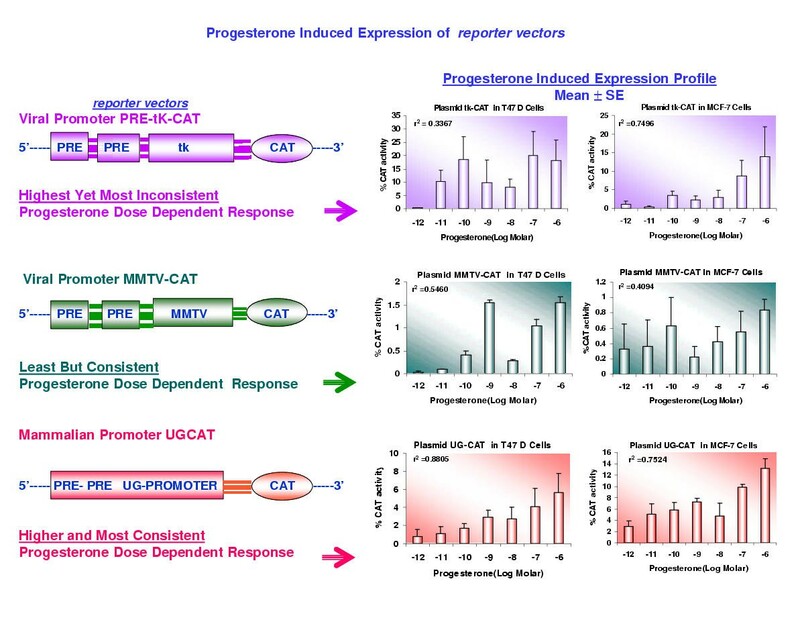 Further, breast cells respond to progesterone in vivo, therefore besides providing PR, they made available cell-base with a milieu of pre-expressed putative cell specific transcription factors required for efficient and cell specific expression of progesterone regulated genes. Breast cell lines T47D and MCF-7 were maintained in Dulbacco's modified Eagle's medium (DMEM, Sigma, USA) supplemented with 10% FBS, 50,000 units lit.-1 Penicillin, streptomycin 50 mg lit.-1 at 37°C, in humidified condition of 5 % CO2 & 95 % air. The integrity of constitutive expression of both the PR isoforms, in these cell lines, was ascertained by immunocytochemical localization, western blotting and whole cell receptor binding assay techniques. Supporting data [see Additional file: 1]. Bacterial strain DH-5α was transformed with reporter vector a) plasmid pPRE-tK-CAT, containing PRE palindrome of herpes simplex virus thymidine kinase gene. b) Plasmid pMMTV-CAT, containing PREs of mouse mammary tumor virus or c) plasmid pUG-CAT, containing PREs of the natural mammalian promoter from uteroglobin (UG) gene by CaCl2 method and amplified for 'maxi preps'(preparing large stocks) of reporter vector. Amplified plasmids were purified on QiagenR (Genetix, Gemany) columns. The integrity of purified reporter vectors were checked by digesting with restriction endonucleases-EcoR I, BamH I Hind III Xha I, and Pst I. Purified plasmids were transfected into T47 D and MCF-7 cells by using a liposomal reagent DOSPERR (Roche Biochemicals, Germany). Prior to transfection 2 × 105 cells were seeded in 35 mm culture dishes. Grown in DMEM medium containing 10% FBS (Fetal Bovine Serum) for first 48 hours and in DMEM containing 5% charcoal-stripped FBS for next 24 hours at 37°C with 95% air and 5% CO2 atmosphere. Just before transfection the cells were washed with DMEM medium and incubated for one hour with fresh DMEM medium without FBS. Transfection mixture of reporter vector plasmid and DOSPERR in the ratio of 1:4 was then added to cells in each dish and incubated for 6 hours at 37°C. At the end of incubation transfected cells were exposed to progesterone concentrations ranging from 10-12M to 10-6 M for 24 hours. Expression of the transfected reporter vector was determined by using an assay that measures CAT activity . The transfected cells were lysed in 0.01 M PBS. Aliquots of supernatant containing CAT enzyme were incubated at 37°C with 10 μl of 14Cchloramphenicol and 20 μl of acetyl coenzyme for 16 hours. Acetylated chloramphenicol was extracted from the incubated mixture with 1 ml. of ethyl acetate. The extract was dried under vacuum, re-dissolved in ethyl acetate and subjected to thin layer chromatography on silica coated plates using chloroform and methanol (95:5) as the mobile phase. The chromatograms were autoradiographed by exposing to X-ray film. The labeled spots were eluted for measuring radioactivity in aqueous scintillation fluid and counted in liquid scintillation counter to determine %CAT activity. Inter assay variation in progesterone induced % CAT activity from six experiments is represented as Mean ± SE after subtracting the uninduced response (basal expression) of respective promoter constructs in respective cell line. To get the best-fit line we applied Linear Regression Analysis using "GraphPad PRISMR" version 4 statistical software package. Uninduced expression of reporter vectors: On transfection, reporter vectors pPRE-tk-CAT and pUG-CAT showed 'basal' (i.e. without progesterone induction) expression in both cell lines whereas, the reporter vector pMMTV-CAT showed no basal CAT expression in T47 D and minimal basal CAT expression in MCF-7 cell line (Fig. 1). Expression of CAT activity by transfected reporter vectors PRE-tk-CAT, MMTV-CAT and UG-CAT into T47 D and MCF-7 cells without the induction by progesterone (in triplicate from six experiments,). MCF-7 cells show over all higher basal expression of CAT activity. Activity of pUG-CAT was 5 fold and that of pPRE-tk-CAT was 2.5 fold in the MCF 7 than in theT47 D cell line. pMMTV-CAT expressed no basal CAT activity in T47 D and minimal basal CAT activity in MCF-7 cell line. The variations in the basal expression viral promoters, in an akin cell milieu of cofactors and number of PR sites suggest that the ligand-independent expression is a "promoter context" occurrence and may have bearing on the ligand induced transcription response profile. Progesterone induced expression of reporter vectors: On induction by sequential doses of progesterone, all the three reporter vectors responded to progesterone doses ranging from 10-12 to 10-6 molar by expressing the CAT enzyme with varying magnitude and consistencies. The reporter vector pPRE-tK-CAT did not show consistency in expression profile whereas pMMTV-CAT as well as pUG-CAT showed dose dependent consistency in expression profile. But also a squelching effect was observed in these two receptor vectors around 10-8 M dose of progesterone (in case of pMMTV-CAT it was at 10-9 M in MCF-7), suggesting a biphasic profile (Fig 2). The connotation of squelching effect around 10-8 molar is not known and needs further investigation. Similar squelching effect was observed in the expression of pMMTV reporter gene construct with luciferase enzyme as reporter was transfected in Chinese hamster ovary (CHO) cells . Diagrammatic representations of reporter vectors evaluated are depicted on the left side and their progesterone induced expression profile is depicted on the right side of the figure. The expression profile of CAT activity was tested in triplicate at every dose of progesterone induction over a dose range of 10-12 to 10-6 molar. Inter assay variation in the % CAT activity from six experiments is represented as Mean ± SE after subtracting the basal activity of respective promoter constructs in respective cell line. Regression coefficient r2 was determined by linear regression analysis using "GraphPad PRISMR" version 4 statistical software package. The three reporter vectors responded with different magnitude of transcriptional response as well as showed variations in consistencies in their expression profile. The viral reporter vector pPRE-tk-CAT transcribed highest but most inconsistent response profile with r2 values of 0.3367 and 0.7496 in T47D and MCF-7 cells respectively (top row). Over the same dose range of progesterone induction, viral reporter vector pMMTV-CAT showed least yet consistency in expression profile with r2 = 0.5460 and 0.4094 in T47D and MCF-7 cells respectively (middle row). The mammalian reporter vector pUG-CAT containing natural promoter also showed transcriptional consistency in its expression profile but transcribed higher expression of CAT activity and better response profile with r2 = 0.8805 and 0.7524 in T47D and MCF-7 cells respectively (bottom row) than reporter vector pMMTV-CAT in both the cell lines. However, a squelching effect was observed in these two reporter vectors at 10-8 M dose of progesterone (in case of pMMTV-CAT it was at 10-9 M in MCF-7), suggests a biphasic profile. The connotation of squelching effect around 10-8 M needs further investigation. The difference in the magnitude of basal expression as well as variation in the magnitude and consistency in expression profile, on induction by sequential doses of progesterone, amongst the viral promoter-reporter vectors pPRE-tK-CAT and pMMTV-CAT, suggests that even in the same cell environment viral promoter respond differently. Further, though viral reporter vector, pMMTV-CAT showed dose dependent consistency on induction by sequential doses of progesterone, the mammalian promoter-reporter vector pUG-CAT showed higher expression at every dose of progesterone induction. In a way, this observation is in coherence with the fundamental attribute of cell specific expression of mammalian genes in response to steroid receptor ligands. The higher magnitude and better consistency in expression of pUG-CAT with best regression coefficient, despite maximum basal expression, indicates optimal utilization of auxiliary specific transcription factors available in an apposite milieu of progesterone target cells for efficient and cell specific expression by natural mammalian promoter, thereby suggesting 'constancy' in expression. We conclude that to get a realistic measure of bioactivities of a drug or a hormone for human therapy, prudence is called for in the choice of promoter controlling expression of reporter enzyme. In the same environment of cell-base, the promoter used in reporter gene construct may influence the expression of dose response profile and thus may affect the outcome of cell-based assays. Viral promoters may be expressed in many cell types. But complexities in their transcriptional magnitudes and consistencies, perhaps due to their 'Passover' for pre-expressed auxiliary specific transcription factors, may sway the dose response profile even in the target cells, which may flaw the measure of 'test' hormones in mammalian cell-based screening system. Mammalian genes are expressed in target cells in response to the biorhythms of hormone concentration, in vivo. Therefore besides magnitude of expression, consistency in dose related expression profile to sequential doses of steroid hormone is also an important indicator of reliability. Thus both 'magnitude' as well as 'consistency' in the dose response profile of a reporter enzyme expression represents "constancy"-the vital determinant of reliability in the function of promoter used in reporter gene construct in a cell based receptor/reporter assays. A homologous receptor/reporter system comprising of target cell, which express receptors in culture as the cell-base and the reporter gene constructs containing natural mammalian gene expression controlling elements, as reporter module, would confer reliability to give realistic measure of bioactivities of hormones/drugs in different formulations, for therapy. The project (NIRRH/MS/1/2003) was supported by grants from the Indian Council of Medical Research, India, CONRAD, USA and Department of Biotechnology Govt. of India. We are thankful to Prof. D.W. Bullock from Lincon University, New Zeland and Prof. Nancy Weigel from Baylor Collage of Medicine, Houston, Texas, USA for their gift of plasmid constructs and Dr.I.Mitra from Tata Memorial Hospital, Mumbai for providing the cell lines. We also appreciate comments and suggestions given during the course of the study by Dr. H.S. Juneja, Former-Director National Institute for Research in Reproductive Health, Parel Mumbai.